Bradford Colliery did not generate any electric power as such, but instead purchased large quantities from Manchester Corporation's Stuart Street Power Station, which was adjacent to the Colliery. The supply took the form of 8 supply cables with an additional 2 from Manchester Corporation's High Street sub-station as an emergency back-up. The voltages from the 2 supplies, nominally 6kV were not always the same, sometimes they could vary by as much as several hundred volts, and for this reason whilst switching. we had to be in constant touch with the control room at the Power Station. There was a large coal preparation plant within the colliery precincts, through which the entire output passed. About 1100 tons a day was fine coal i.e.less than three quarters of an inch, which was passed directly to the power station bunkers via a purpose built tunnel and conveyor system, which carried the coal for about half a mile underneath a densely built-up area and several streets. And so, in the spring of 1956 I found myself responsible on a statutory basis for the safety of all the electrical equipment associated with a large modern colliery and managerially responsible for its reliable working. I had the lot: 2 large winding engines, three compressors, locomotive system, telephones, signalling system, in fact, anything at all which had a wire attached to it.. For some reason the Servo mechanisms associated with each winding engine were considered " Electrical". After 2 or 3 years and the job settled down, and it was a most rewarding means of employment, it would be fair to say that I enjoyed every minute of it, and it was an experience which I would not have missed for anything………. And yet, I couldn't see myself doing this job for the next 25 years or so, and I began to get restive again, and started once more to apply for jobs which would give me greater seniority. After the war, the National Coal Board started a scheme whereby graduates who had a yen for working in the mining industry could apply for training. It was known as the D.P.T. Scheme (directed, practical, trainees), and those selected would be given several years in appropriate training, and afterwards would be offered posts in the mining industry commensurate with their abilities and training. Mining engineers, electrical and mechanical engineers could all be included in this scheme, and I knew about 20 of them personally. One of them, Mr. E.P. Bradshaw, became manager of Bradford Colliery during my time there, unfortunately he was killed in a road accident a short time later. And so, time crept on; the stowing operation described earlier was not completely successful, since it is never possible to obtain 100% compaction. Manchester Corporation's huge gasometer in Bradford Road, about ½ mile from the colliery, began to tilt slightly, because of subsidence; you could just about see the tilt with a naked eye if you looked hard enough, and I heard a figure of £1,000,000 mentioned by way of compensation, and this when connected to a rapidly shrinking market sounded the death-knell for Bradford Colliery, and it closed in the early 1960's. 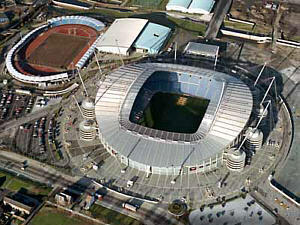 Not a single clue remains to this day of its existence, and the Manchester City football stadium, built for the Commonwealth Games in 2002, lies on the site. During the preparation work for the Games I saw some old photographs on local TV, and one photo showed both the pit headgears; I never achieved this myself, and have often wondered where the photographs were accessed from.